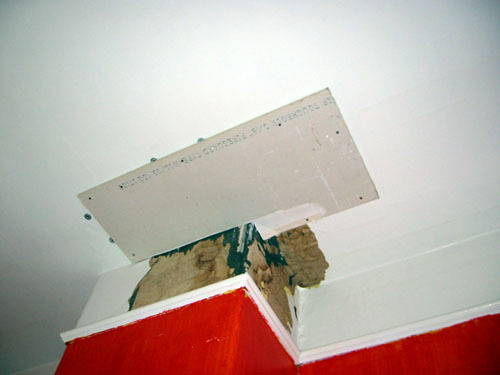 After contemplating the ceiling for a long time Tuesday, I decided to use the brute force method. We're going to have to let the rest of the ceiling fall and redo it eventually, so there was no point in spending a lot of time or effort on a perfect patch. Some digging in the fasteners pile revealed brass screws that were long enough to go through 5/8" thick drywall, the ceiling plaster, and into the lath, and when Noel got home, he help me screw this piece to the ceiling (with much muttering about how much he hates this sort of thing and would happily pay way too much to have somebody else do it in the future). 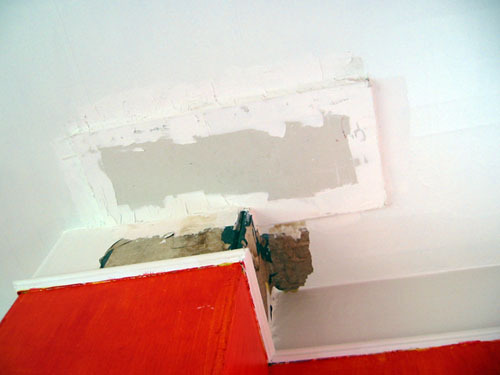 Then I used tape and mud to seal off the edges and the tiny bit of hole still remaining. Very ugly work, but functional. That old wallpaper under there is going to cause trouble, I know. But for now, John doesn't have dirt falling on him every few minutes, which is what really matters.